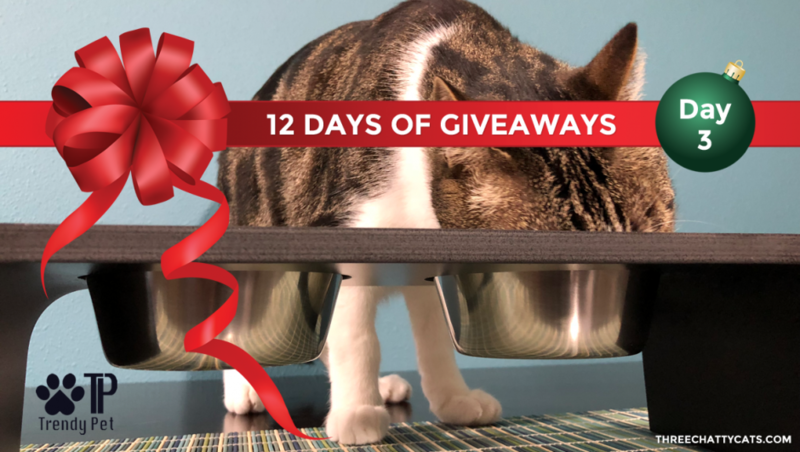 It’s Day 3 of 12 Days of Giveaways and it’s presented to you by Trendy Pet! We’ve featured this company before on the blog and we’re happy to have them back. Trendy Pet makes stylish feeders for both cats and dogs as well as health and wellness items and accessories. 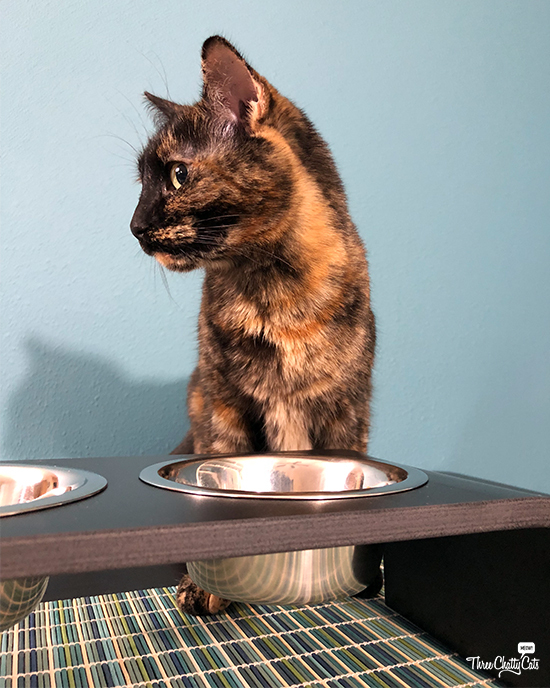 Trendy Pet sent us one of their 4-inch elevated feeders for the cats to try. Why Choose An Elevated Feeder? I’ve been guilty of feeding my cats on the floor. What do I mean by that? I just put their food dish down directly onto the floor. But is using a raised or elevated feeder with your cat better? Yes! Raising their food dish or using an elevated feeder allows for better posture while eating and can also aid digestion. When a cat’s dish is on the floor, the cat must crouch down, which can crunch the cat’s stomach in. But if they’re in a sitting position, their stomach isn’t pressed in and the cat is in a more relaxed position while eating. A sitting position also promotes better digestion for the cat. Gravity can work its magic and help the food stay down. Have you ever seen your cat scarf down their food, only to have it reappear right away? The sitting position may help reduce this. 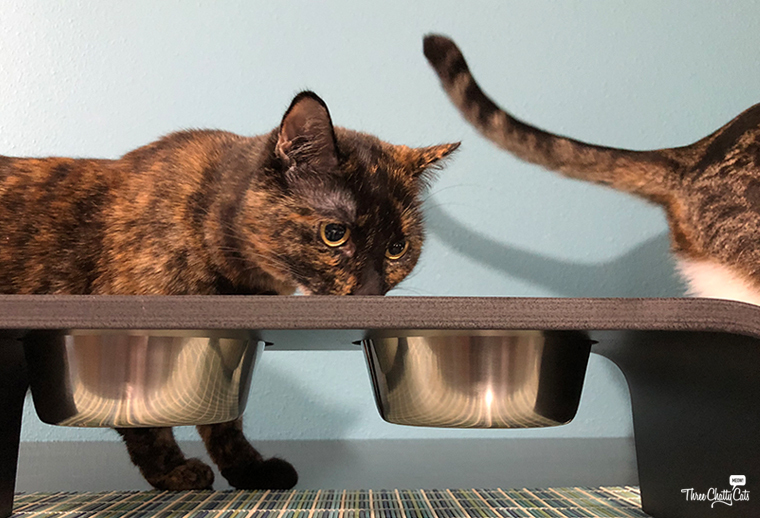 Older cats may also benefit from an elevated feeder. Their joints can be stiffer and crouching down to eat may be uncomfortable for them. Disclaimer: I am not a veterinarian, nor do I have any medical background. If your cat has trouble eating or keeping food down, you should check with your veterinarian. 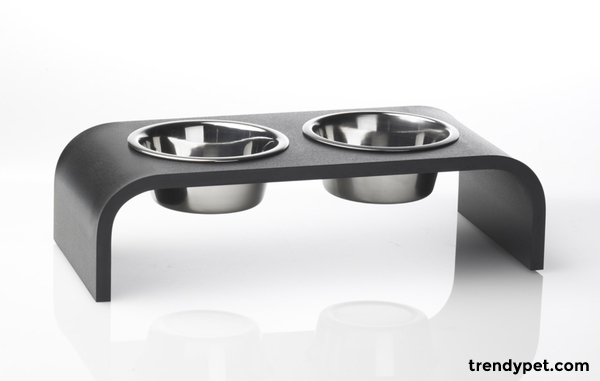 Trendy Pet provided us with their 4-inch, 2-bowl elevated feeder to try out. Now, I’ll be honest. Getting my cats to eat is pretty easy, no matter what the dish or if it’s elevated. Which means that getting them to eat from the elevated feeder was as easy as putting food in the bowl. But just knowing that they’re more comfortable while eating from an elevated feeder makes me feel better and want to do what’s best for them. Mama: What do you think, Woodrow? Woodrow: I can’t hear you over my chomping. Woodrow: Sorry, what’d ya say, Mama? Mama: Do you like the elevated feeder? Woodrow: Is my bowl empty? Olive: Move along, Woodrow. Let me check this out. Olive: Mama, there’s something wrong here. Olive: This bowl is empty! Can I get some service around here? No tip for you! The elevated feeder comes in black or white and is available for order at trendypet.com for $60.00. But right now, Trendy Pet is having a storewide sale with everything 25% off until the New Year! Trendy Pet also sells on Amazon. Trendy Pet is owned by a mother and daughter team – Maureen and Devin – who started the company because they wanted elevated feeders for their dogs. But their dogs were different sizes, so they went to work on creating a solution. And Trendy Pet was born! While they don’t have any cats at home, they do know the importance of elevated feeders for cats as well. And they even make a Whisker Stress Free Cat Feeder that we reviewed earlier, which is quite stylish and also elevated. Keep up-to-date with the latest from Trendy Pet on Facebook, Instagram and Twitter! 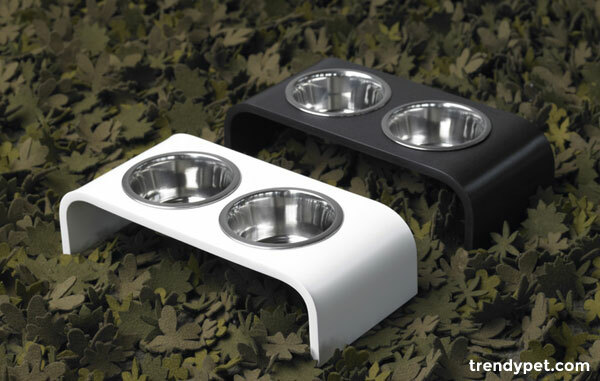 Trendy Pet is allowing us to give away one 4-Inch Elevated Feeder to one lucky winner! The winner can choose either white or black. Simply enter a blog comment below and then enter the giveaway through Rafflecopter. The giveaway is open to U.S. residents (details below). The giveaway is open to residents who reside in the United States, 18+ years of age, except where prohibited by law. One winner will be selected randomly by Rafflecopter and contacted via email. The winner will have 48 hours to claim their prize. Failure to do so will result in forfeiture of the prize, and a new winner will be randomly selected by Rafflecopter. The giveaway closes on Saturday, December 8, 2018 at 5:00pm Pacific. 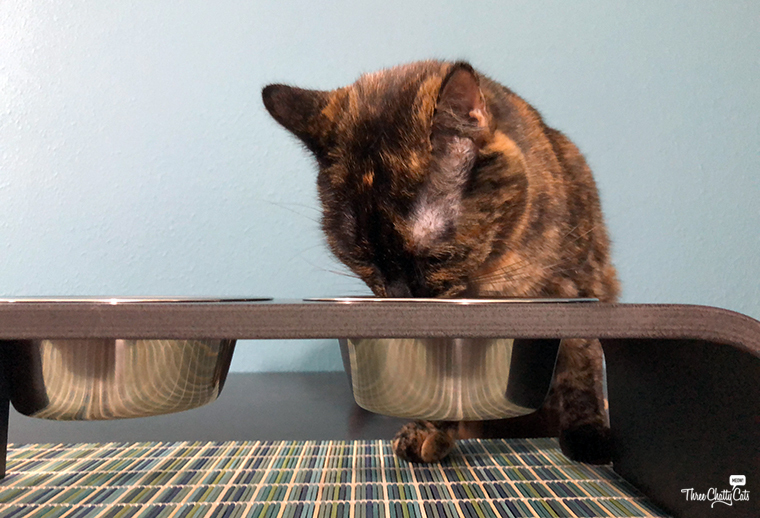 Do you currently use an elevated feeder or raise your cat’s bowl off the ground? 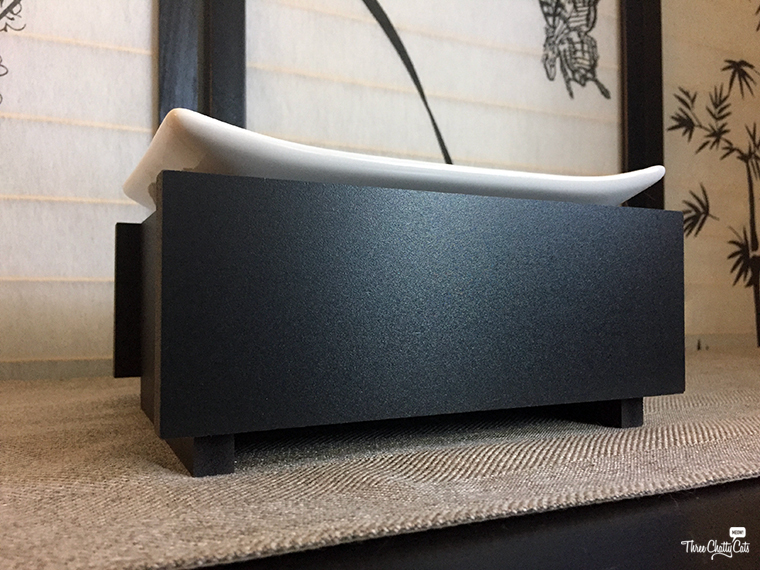 that looks super stylish… and according to a wise man the eyes eat with us… and they will love this feeders! 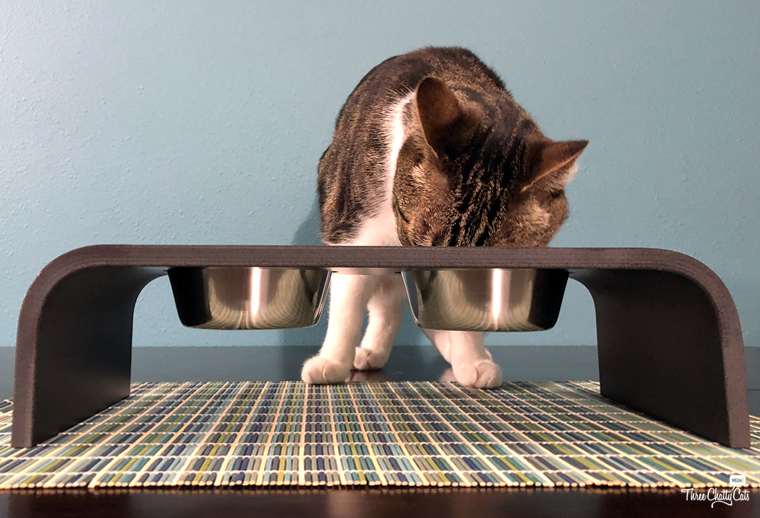 I’ve always loved these elevated feeders….they look great and I once tried to imagine having to bend down to eat all my food and didn’t like the idea – so why should cats and dogs have to do that??? They don’t! Anyway, we’d love to win one – either color – sure makes all kinds of sense to use an elevated food station. We really need to set up a second feeding station and this would make a purrfect start! I like the idea of elevated water dishes but I use flat containers for food (whisker thing). We don’t have an elevated feeder yet. When I saw the first pics, I thought about whisker fatigue but then I see the one below with the elongated dish and YES!! Love this idea! Thanks for the great review! I have never used an elevated feeder before, but it sounds like a great idea! 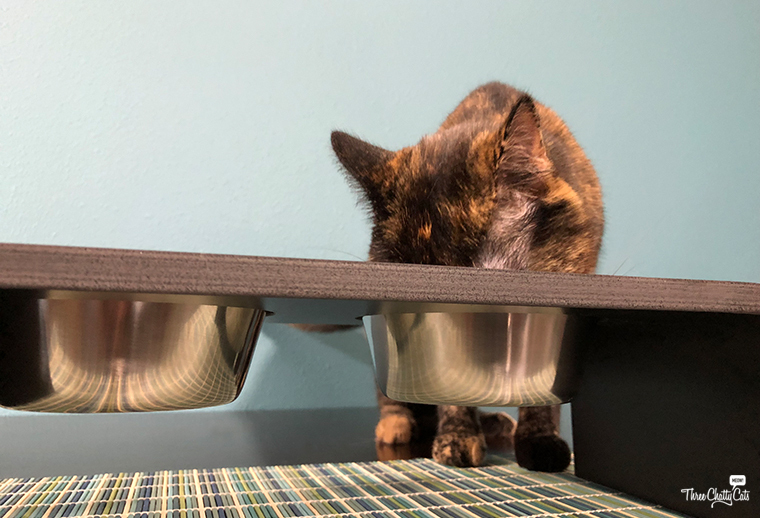 I have an older cat and I think this would make eating easier for her. It is also great looking! I used to raise my cats bowl by putting a book under it. This elevated feeder would be a lot better! Ooo I love the way these look! 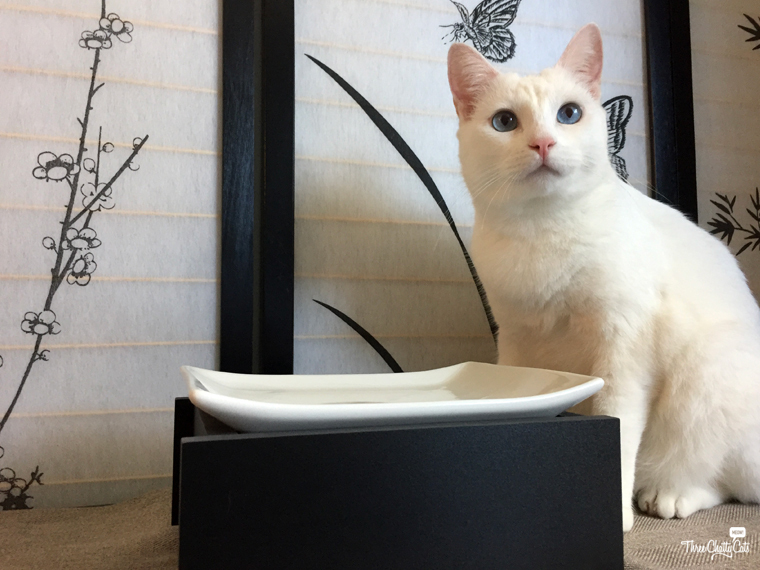 I don’t currently use an elevated bowl for my kitties, but I like the sleek look of this one. It will be easy to keep clean, and I think my older kitty would love it! Nice, do they have inserts to slow down eating? I find that is another part of why my cats will regurgitate what they eat. Like the idea that the top is solid and water resistant. Thanks for the share. We really love the way it looks and helps a kitties when they are eating. Woodrow was chomping down like there was no tomorrow. Great photos of you beautiful ones. Your going to need a bell so they can ring for service. Have a wonderful day. Those are some snazzy feeders – we like! That is some classy feeder, we like! I just raise my cat’s bowl off the ground. I do not have the elevated feeder as of yet. That is a lovely and stylish looking feeder. All of us have raised bowls. It makes eating much easier. That feeder is very nice. I use a flat cardboard scratching post to elevate one of my cat’s food bowls. The other food bowl sits on the floor. I want a black elevated feeder. I put my pet bowl on a step so it is elevated for him. This would be an improvement. Those look great. We don’t have any raised feeders. This is a great idea. 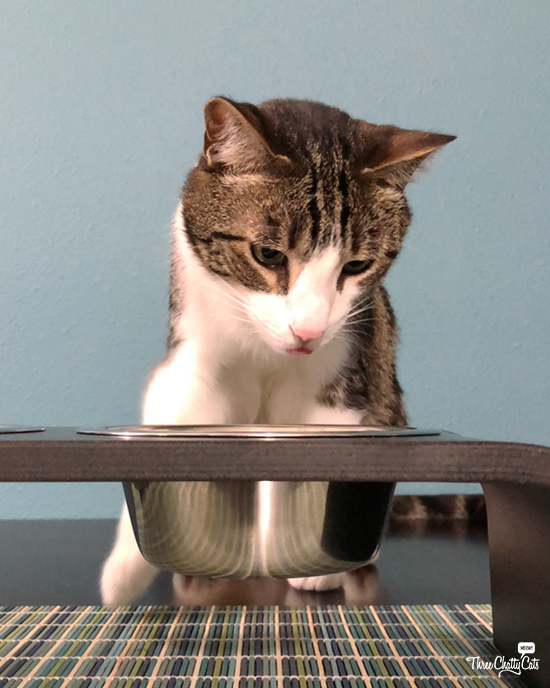 I elevate my cat’s bowls, because it allows him to stretch his neck when he’s eating or drinking, which makes it easier for the food or water to go down. I’d love this. yes, i do, my vet even recommended doing it. i have been using one for many years. I do not elevate my cat’s bowls. No I don’t currently use an elevated feeder. This would be very ideal for my cat, Daisy Mae. If and when I win(thinking positive), I would choose the black. Maybe my cat would eat more if it were from an elevated feeder. Oh I hope I win. I’ve never tried a raised feeder for my cats. I think they would like it. The doggie that came before the Basset Hound used an elevated feeder. It kept the bowls contained, too, so they wouldn’t get tipped over when he scarfed down his kibble. Mom set my food bow up on a cake stand a few times to elevate it, but hasn’t since. Winks. Yes they use a raised feeder but could use a sturdier one. I like the white one. Our mom has been wanting to try Trendy Pet products since forever!! Our paws are crossed that we win. P.s. You guys are doing a great job with your 12 days of Christmas! I don’t use an elevated system, but would like to start. I just use a regular bowl and placemat. My mature cats would love one of these! We have one elevated bowl, which my eldest beauty uses. This would be perfect for us. Thank you for the opPURR-TUNA-ty to win! We don’t have an elevated feeder but my cats would surely like one. I don’t have any elevated feeding stations, but sounds like I should! I don’t currently use an elevated feeder. My cats would love one! I do not raise their bowls off the ground. I do nto currently use an elevated feeder but I’ve heard it is better for cats and dogs.